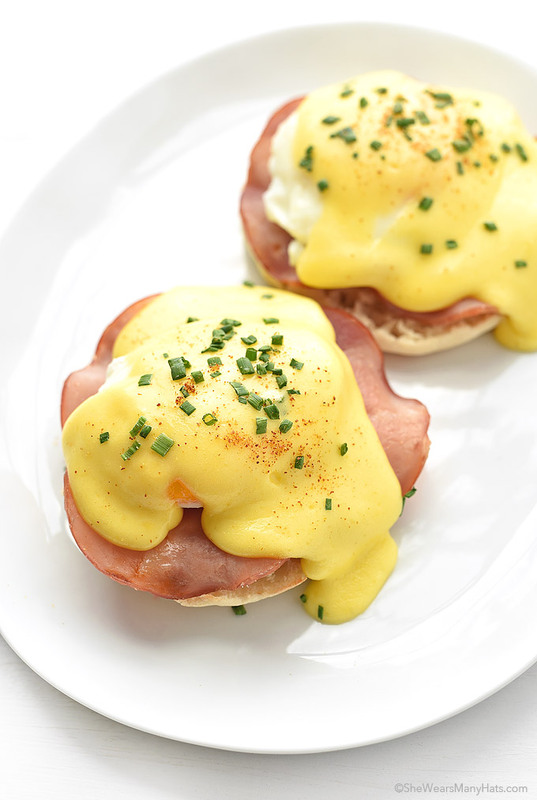 Classic Eggs Benedict, topped with homemade Hollandaise, is an over-the-top start to the day. Rise and shine! Welcome my favorite person, Randy, as he shares about a memorable meal we enjoyed a few years back. Take it away Randy! Every time I have Eggs Benedict I am reminded of the best Eggs Benedict I’ve ever had. We were on a family vacation in St. John, USVI. We made the trek East to Miss Lucy’s Restaurant, located on the arid side of the island. Miss Lucy’s came highly recommended so we found ourselves at a picnic table under a shade tree ready to enjoy Sunday brunch. Friendly live chickens were strolling about. Goats in a nearby pen were enjoying the morning too. 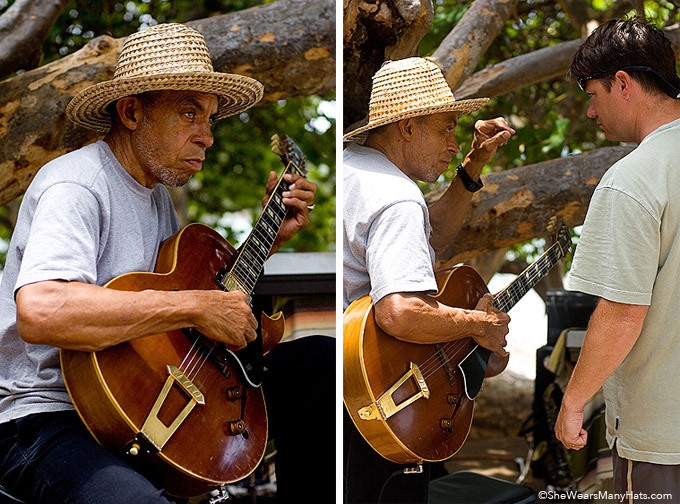 A jazz duo were playing some mellow tunes. They sounded great. I spoke with the guitarist during a break. I asked him about his super cool guitar. He said it was a Gibson L4 from the 1950’s that had survived falling off a truck in Mali during a tour some years earlier. (Funny how I can remember details from years ago but I can’t remember where I left my keys earlier this morning.) The Eggs Benedict that day was as superb as the setting, the sounds and the company. It’s something I’ll never forget. 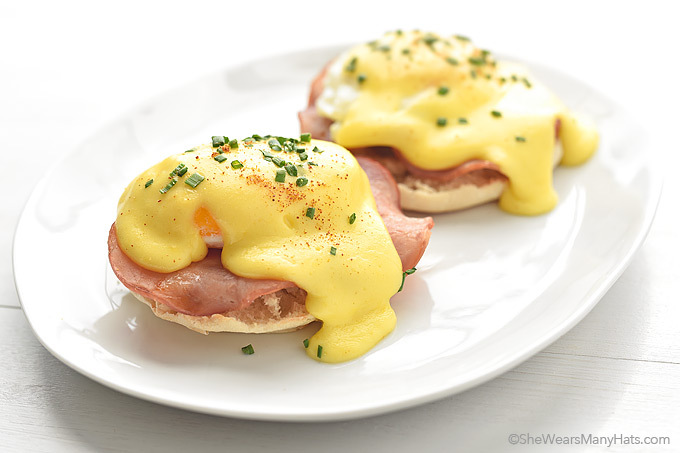 Thankfully, we don’t have to wait to be on vacation to enjoy Eggs Benedict. It’s easy to make right at home. And when topped with a homemade hollandaise sauce you can close your eyes and pretend to be in whatever heavenly place you can conjure up in your mind. Enjoy! If you’ve never poached eggs before, it’s not as difficult as you may think. Check out tips and tricks in this post on How to Poach Eggs. Once you learn how to make fresh Hollandaise Sauce you will be whisking up batches to go on everything. It’s not just for Eggs Benedict! A few simple substitutes for Canadian Bacon: regular bacon, prosciutto, ham, smoked salmon, avocado. 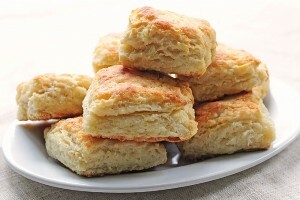 A classic breakfast or brunch recipe perfect with homemade Hollandaise. Brown Canadian bacon in a skillet. Plate English muffins cut side up. Place two slices of Canadian bacon on top of each muffin half, top with a poached egg. Drizzle warm Hollandaise Sauce over the egg. Garnish with fresh chopped dill or parsley. Originally posted April 30, 2015. Great story and great to hear from you, Randy! I love Eggs Benny! And, your post reminded of all the little places I dined on St. Thomas yeeeears ago. I substitute Trader Joe’s incredibly good pork belly for ham or bacon in any dish because of sodium issues. I just slice it and drench it in maple syrup (grade B) and liquid smoke and fry it up. Thanks for the recipe and the memories. It would be good on everything, Natalie! I’m so in love with Hollandaise sauce. I seriously love everything with eggs! Me too, Charissa! We eat eggs daily. Thank goodness they are a healthy food, in moderation, of course. Thank you, Sabrina. What did you make? I did a cornmeal pancake, topped with a lime crabcake and an over easy egg. I had some spicy remoulade piped on top. I think my husband drooled on it before I could finish taking photos of it, haha. 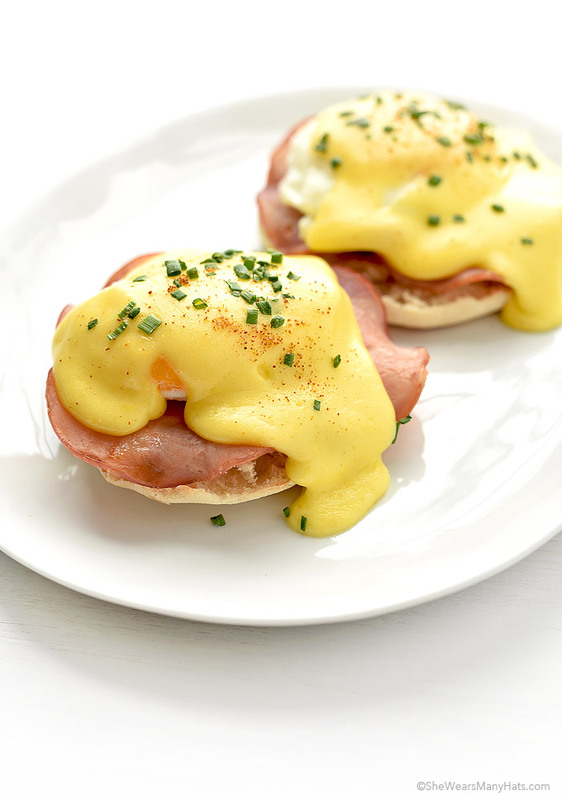 Your hollandaise looks seriously amazing, clearly I need to make the recipe – love a classic eggs benedict! It’s so delicious, Thalia. I want to put it on everything! I too always think of the best Egg’s Benedict I ever had…some small restaurant in the Laurel Mountains of PA some 20 years ago. It’s actually on my menu for this week…it will be a brunch, lunch or dinner in my house. For me it’s a timing thing with this dish…toasting, poaching and making the hollandaise all at once…well needless to say my kitchen is a disaster as I try to get it plated at it’s peak,but, it’s always an appreciated dish that my family loves. I hear ya. It’s helpful to have a few extra hands to split the tasks up. 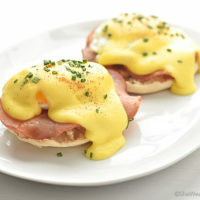 Eggs Benedict are my all time favourite. So I come to Pinterest to find a good Eggs Benny recipe. Oddly enough, the one I pull up not only has a great recipe, but you speak of my most favorite place on Earth- St John!!!! We are heading there again in just 33 short days and I can’t WAIT to go to Miss Lucy’s!!! Thanks for sharing this recipe!! I’m delighted to have this receipe for Eggs Bennedict too; thank you! However, Sabrina brought up a spicy sauce I haven’t tasted for years and love as well. It too brings back a memory for me… Remoulade Sauce! And you know, I’ve never had a receipe for that one; can you help me out? I followed your directions & it all turned out perfect! What a treat, thanks! !